Residents in Brandon received a little bit of good news Tuesday when city officials reported river levels on the Assiniboine River have not increased in the past 12 hours. Dikes along First Street have been built up and the access routes heading north and southbound from Highway 1 are expected to reopen sometime today after additional water is pumped out. Evacuations began Monday, as 399 households — roughly 700 people — registered at the Keystone Centre. Some residents have also self-evacuated from other areas of the city. It’s expected those who are out of their homes could not return for several weeks. However, the city is allowing organized groups to return to only check on sump pumps and gather medication. Gas has been shut off to 365 homes in the evacuation area, but drinking water throughout the city remains safe. Police and private security are patrolling evacuated areas to ensure they remain off-limits. Water levels are expected to remain high, despite having not increased overnight. On Tuesday, the Assiniboine sat at 1182.80 feet. 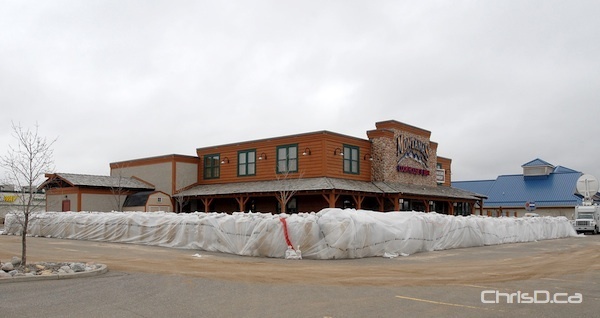 Mayor Shari Decter Hirst encouraged residents to not shop at the Corral Centre on 18th Street, as numerous businesses have voluntarily closed their doors and put up their own sandbags. The mayor says businesses in the south end of the city are more accessible at this time.